Andrés Montalván graduated from the “20 de Octubre” Elementary School of Visual Arts (1981), the San Alejandro School of Fine Arts (1985) and the Superior Institute of Art (1990), all in Havana. He is a sculptor, draftsman and professor, and has also taught sculpture at the San Alejandro School of Fine Arts in Havana and the Juan Pablo Duarte Vocational School of Visual Arts in Güira de Melena. His solo exhibitions include El dolor de la existencia (The Pain of Existence) at the Center for the Development of Visual Arts in Havana, 1999; lmpresiones (Impressions) at La Casona Gallery in Havana, 1999; Los cimientos del alma (The Foundations of the Soul) at his Studio in Havana, 1997; El hombre que camina (The Walking Man) at the Provincial Center for Visual Arts and Design in Havana, 1996; Rostros en la muchedumbre (Faces In the Crowd) at Forma Gallery in Havana, 1995; and La puerta del espíritu (The Door to the Spirit) 23 y 12 Cultural Center in Havana, 1995. His sculptures have been placed on public sites in different cities in Cuba, including Varadero, Güira de Melena, Cayo Largo del Sur and San José de las Lajas. 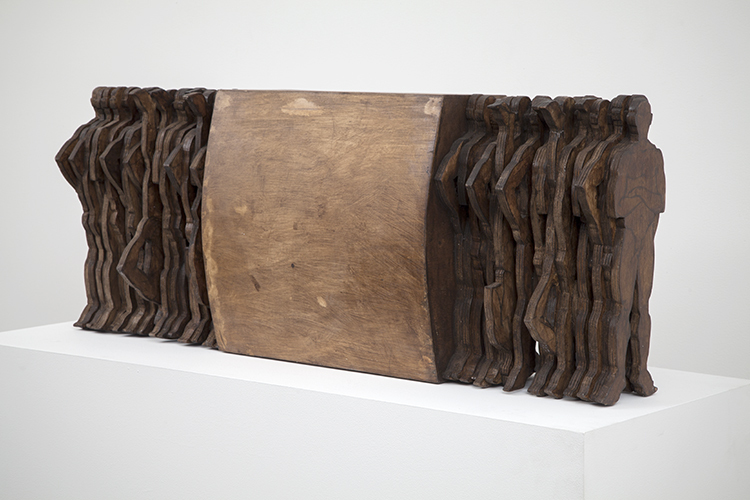 Eterna idea del regreso (Eternal Idea of the Return), 2012. Wood, 18 x 47 x 11 in.